University of Oregon chemists have created a new class of fluorescent dyes that function in water and emit colors based solely on the diameter of circular nanotubes made of carbon and hydrogen. The six-member team reported the discovery that is now being explored for its potential use in biological imaging in the journal ACS Central Science. 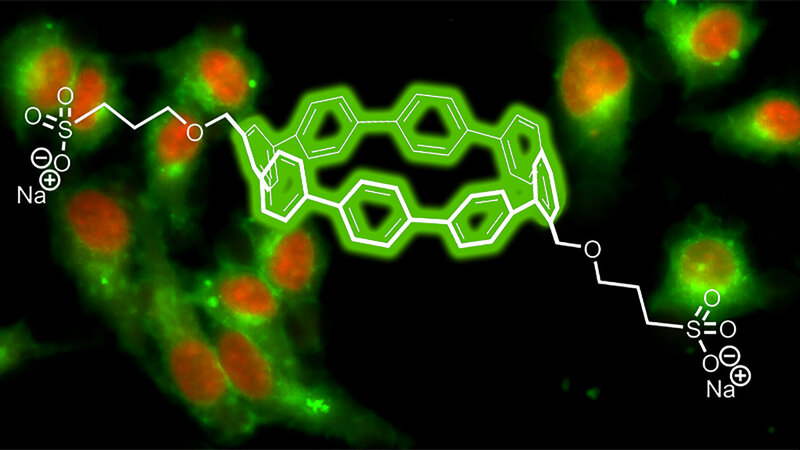 "The fluorescence of the nanohoops is modulated differently than most common fluorophores, which suggests that there are unique opportunities for using these nanohoop dyes in sensing applications," said Michael Pluth, a professor in the UO's Department of Chemistry and Biochemistry. "These dyes retain their fluorescence at a broad range of pH values, making them functional and stable fluorophores across a wide range of acidic and basic conditions." The nanohoops have a precise atomic composition, Jasti said. Once a chemical sidechain was designed by Brittany M. White, a doctoral student in Jasti's lab, the nanohoops became soluble and passed freely through cellular membranes, but didn't go to particular sites. In a next step, Yu Zhao, a postdoctoral researcher in Pluth's lab, explored where the nanohoops were going inside cells and whether they can be guided to particular sites inside of cells. An added sidechain containing folic acid led the nanohoops to cancer cells. Toxicity levels of the nanohoops are no different than in traditionally used fluorescent dyes, he added. In a newly funded effort, Jasti is working with Xiaolin Nan of the Department of Biomedical Engineering at Oregon Health & Science University in Portland to pursue the use of the nanohoops in biological imaging. "We have seen nothing like these nanohoops in the world of dye chemistry before," said Bruce P. Branchaud, professor emeritus of chemistry and biochemistry at the UO.